Hollywood Black Stuntman Named Grand Marshal of Lexington Christmas Parade 2017! 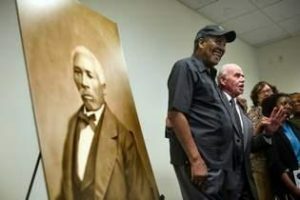 William Robison, an expressman and civil rights activist who settled in Stockton in the mid-1800s, was honored Tuesday during a brief ceremony at the University Plaza Waterfront Hotel. 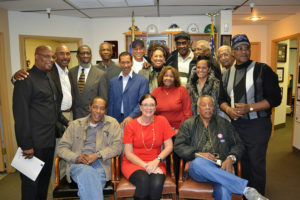 The Stockton City Council was also scheduled to recognize Robison during its meeting Tuesday. Robison’s history and impact in Stockton was mostly unknown until Willie Harris walked into a Wells Fargo Bank in 2010. While waiting in line one day, Harris said he saw a small photo of the stagecoach driver on the wall. Curious as to why the bank had a photo of a black man, he asked Wells Fargo for more information, he added. Through the bank and his own research, Harris learned the history of Robison, who for 40 years worked as an expressman who delivered packages, money, and other items, for the bank. Robison, who was born into slavery in Virginia, fought for the right of black women and men to be able to testify against white individuals during civil and criminal cases. He served in the Army, petitioned against segregation and was reported to have been a member of a group who liberated slaves being illegally held in San Joaquin County. Harris, 74, became an ardent advocate for Robison despite having no personal connection to him. His impact goes beyond working for the bank, he said after the ceremony. “I wanted the community, especially the black community, to know who (some of their heroes were),” he said. 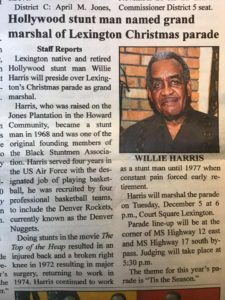 So for more than five years, Harris, the president of the National Black Stuntmen’s Association, made repeated pleas to Wells Fargo and the city of Stockton to acknowledge Robison. Doug Wilhoit, CEO of the Stockton Chamber of Commerce, was a guest speaker Tuesday. His great-great grandfather, Roley Early Wilhoit, knew Robison well and had a lot of respect for him, he said. Wilhoit didn’t know about the connection until Harris contacted The Record, which featured Harris’ mission and Robison’s work. During the ceremony, Wells Fargo provided three $1,500 scholarships in Robison’s name. Scholarship recipients Kira Maszewski, a senior at Cesar Chavez High School, and Stagg High School senior Destynee McCollum both said they didn’t know who Robison was, but have since learned about him and are inspired by his activism. Anisah Zarif, a senior at Edison High School, was the third scholarship recipient. Harris, whose organization’s mission is to fight for equality for stunt performers, said he’s not sure what he’ll do next, but he’s not done asking for more recognition for Robison. Particularly, he said, he’d like for Wells Fargo to feature Robison in a commercial. Robison may not be able to speak for himself, but Harris said he will continue to do it for him.